Certified Nursing Assistants participate in the care of patients under the direction and supervision of Registered Nurses (RNs) and Licensed Practical Nurses (LPNs) and other medical staff. CNAs spend a great deal of time with patients and assist them with personal care tasks, such as bathing, dressing and feeding. Nurse assistant training programs prepare them to perform support functions such as measuring vital signs, transporting patients, answering patient calls, and reporting concerns to senior staff. Other tasks include setting up medical equipment for medical procedures. The job is physically taxing as CNAs are actively involved in the moving and lifting of patients. Prospective CNAs must be compassionate, patient, and emotionally prepared to deal with patients who are forgetful, needy, or aggressive. 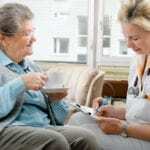 A boom in the senior population and longer life span create a high demand, and job opportunities for CNAs are expected to increase over the next decade. While there are hospital-based jobs, opportunities in long-term care facilities exceed those in hospitals. Home health also presents abundant opportunities as patients opt to recover in their homes following surgery or serious illness. 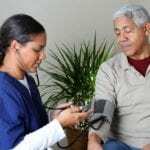 Commonwealth Nursing Services and Home Care Inc has the state’s approval to provide nursing assistant training to prospective employees. The in-house training attracts numerous applicants each year, so enrollment is a competitive process. Qualified instructors emphasize long-term care performed under the direction of a licensed nurse. A blend of didactic training and hands-on skill prepare students for success on the state’s nurse aide competency exam. Classroom topics include infection control, nutrition, vital signs, resident rights, nursing principles, medical terminology, anatomy and physiology, observation and reporting. Students must attend all classes and earn a minimum C grade to qualify for graduation. Applicants must obtain criminal background clearance, TB clearance, and required immunizations. Graduates may qualify for employment at Commonwealth after passing the competency exam for state licensure. Address: 40 Church St., Lowell, MA. The 100-hour nursing assistant program at 3Dimension Health Services prepares students for entry-level careers in long-term care facilities, hospitals, nursing homes, and home health agencies. The program comprises of classroom instruction, hands-on lab and supervised clinical experience in a skilled nursing facility. Students learn the techniques for proving safe and sound procedures through lectures, interactive discussions, and videos. Students learn medical terms, how to support patients with the activities of daily living, how to measure and record vital signs, and lifesaving skills such as CPR and first aid. Real-world training in a healthcare facility, under the supervision of a licensed professional, reinforces the day-to-day tasks that are common for nursing assistants. The training prepares students for success on the licensing exam. The cost of attendance is $870 including tuition, books and badges, and administration fee. Students must cover the cost of uniform, clinical supplies, criminal background check, TB test, and immunization. The 100-hour nurse assistant training program at Middlesex Community College includes 24 hours of weekend clinical training at a long-term care facility. The comprehensive training prepares students for success on the Massachusetts nurse aide certificate exam and entry-level career as a nursing assistant. Both the didactic instruction and hands-on training emphasize appropriate care for residents in long-term and acute care settings. Topics include vital signs, lifting and turning patients, personal care, record keeping, mental health care, stress management, patients’ rights, and safety. Applicants must possess a high school diploma or GED and pass the school’s literacy exam, complete a CORI/SORI background check, health immunizations, and have the physical ability to lift and move 50 pounds. The course fee is $995 in addition to the fee for the state exam. The focus of the CNA training at Lynn Vocational Institute is to provide students with a foundation in human behavior and development, nursing skills, geriatrics, nutrition, and medical terminology. Students must complete the classroom and clinical requirements to be eligible for the state certification exam. While the primary goal of the program is to ensure students have the skills to care for patients in acute and chronic settings, instructors emphasize mathematics and written verbal communication skills to develop a well-rounded health care professionals. The program is ideal for high school students who want to explore a career in health before deciding on a career path. Instruction includes orientation to health care, performing special procedures, assisting patients with nutrition and hydration, health care administration, assisting with the activities of daily living, OSHA 10-hour certification, patient comfort, special procedures, measuring and documenting client information, providing support for cognitively impaired patients, and preparation for the state licensing exam. Applicants for nursing assistant training at Spectrum must have clean CORI and negative TB result as a requirement for the clinical component of the program. The combined didactic and skills instruction prepare students for the challenges they’ll face in the dynamic healthcare sector. The curriculum adheres to the Federal and state guidelines for nursing assistants but also covers the skills that will help graduates succeed in any work environment. Training begins with instruction in the classroom and lab designed to impart theoretical knowledge and give students insight of the clinical aspect of the training. The clinical rotation develops practical skills as the students provide direct care services at a long-term care facility under the direction of a Registered Nurse. Training includes a nurse assistant’s role and responsibilities, aging and development, safety, residents’ rights, observation and reporting, activities of daily living, infection control, mental health patients, communication, nutrition and hydration, care for a dying resident, and home health aide. Graduates receive a certificate of completion which makes them eligible to take the state licensing exam administered by the American Red Cross. Tuition is $1000 for the 120-hour course. Books and supplies will cost an additional $131. Day and evening classes are available. The following school provides Board-approved nursing assistant training for high school students.